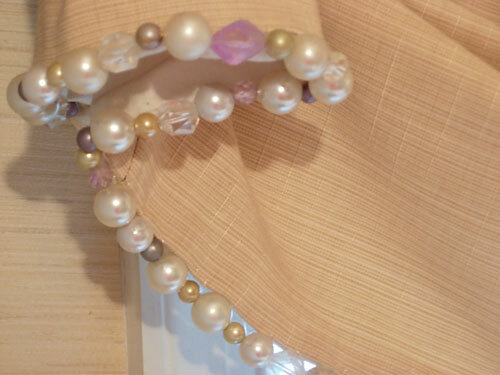 Why settle for a plain window valance when with a little extra handy-work you can create a truly unique window treatment with DIY beaded trim. A fabric window valance is a very cost effective treatment for a window as it requires only a small bit of fabric. The most expensive part of creating this valance for me was the cost of the pattern. I used a M’Fay pattern. You can find it on their website, it is called – Empire On a Rod. I found the fabric in the $1.oo a yard bins at my local fabric store, the rod at a yard sale. I white washed it with watered down paint. I have a stash of beads that I picked up inexpensively at flea markets over the years. I spent about $7.00 on the materials and about $10.00 on the pattern. After sewing the valance, I added the beaded trim and then simply stapled the whole thing onto the wooden rod. If you find it gets heavy and the rod rolls around in the rod holders, place some Velcro in the rod holders and the opposite side of the Velcro onto the area where the rod covered with fabric meets the holder to keep it from rolling. You may not run into this problem depending on what kind of window treatment you sew the beaded trim on. The trim is basically a long strand of beads, like a necklace that I sewed onto the edge. 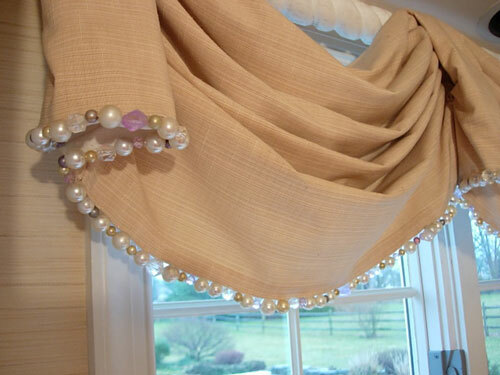 I made this valance, but you can add the beaded trim to a store bought window treatment, too. 1. Measure the length of the finished edge on the window treatment. 2. Cut a piece of clear nylon thread or Streen (fishing line) to edge measurement, plus about 6″ extra. 3. Knot one end of thread and string beads on until you reach the desired length. Knot other end. 5. When you reach the end, create a few locking stitches and knot. Cut excess. You may remember this photo from my Kitchen cabinet post. You can see the valance over the sink. Gorgeous! How did you gather the material for the valence once you attached the beads? very pretty! would be so fun with holiday colors! Thank you for these tips, they are amazing! I moved into a new home and was looking for tips on how to make sure I do my own window treatment well. I got similar tips from http://curtainchannel.com/do-it-yourself-window-treatments.html so it might be helpful to others. Once again, thanks for these tips! cute! i’m going to try making my own version in black & white! thanks for the idea! “Purple” makes me happy. Especially when it is vibrant. You have such great ideas and ways to display your items. I truly look forward to my updates from you. Happy Easter…. This looks nice! Very creative! i came by to let you know that I’m featuring your designer giftbag idea for this week’s Friday Favorites. Come by and get a Featured button if you’d like. I love that! So pretty! Come stop by my Favorite Things Friday Party if you would like to join in! Krlley – Your comment would have made a great title for the post. Beautiful! Never can have too much “bling”… this looks great. Love the extra detail it adds. 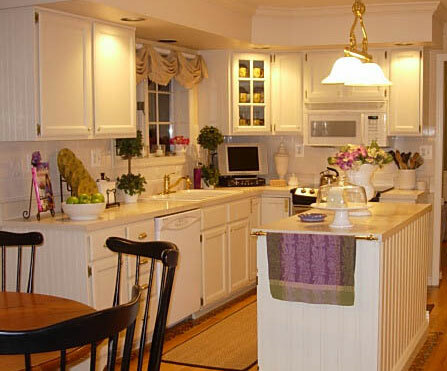 Beautiful kitchen too! The beaded trim looks fabulous! Love the tutorial and the illustration! Very clever idea! Great idea. Love your kitchen. I’m definitely a bold color person but when I see a neutral room like your kitchen, I truly love it and think I might want to try something similar. Great job with the trim. Love! It’s like jewelry for valances. Brilliant! I like this idea. Looks great. This looks lovely. I love the beaded trim!